Last fall I started looking for a food podcast to listen to. I have very strong food values and used to do talks on food mindfulness and spirituality, food politics, and food culture. I remembered during my long days at my food store 6 or 7 years ago listening to this great program from British Columbia about their local food movement which was heavy on politics. After having been out of the food industry for 5 years I was really feeling a yen to get back into it. So, there I was looking for podcasts, like the one I used to listen to. I asked in a number of podcasts groups on Facebook and Google+ and Reddit. I listened to and deleted many shows which were not what I was looking for. Lots of shows about wellness, body image, unhealthy relationships with food. Totally not what I wanted, and not things I could relate to, really. I was starting to feel like I needed to create the show I wanted - a lot of love and celebration of food, how it is prepared, how it is grown, the people who make it possible for us to eat. I even had a co-host in mind. I haven't completely abandoned the idea, but two things happened between then and now. One you all know about, the dissolution of my relationship (if I start talking about it in legal terms it might make it less emotional, right? ), and finally finding shows about food that gave me what I was looking for. I'm still disappointed that every one of them is American, which isn't terrible, but when they do get into more of the politics and processing we have very different systems. But the celebrations of food and chefs and farmers is universal. 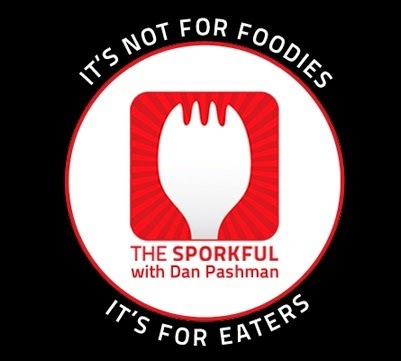 So, after that long introduction, I want to share the most recent episode of one of those shows I follow now, Sporkful. Sporkful, whose tag line is "It's not for foodies, it's for eaters" is very much a celebration of food and it makes me happy to listen to it. It's part of the WNYC network which is one of the many really great public radio stations you can find all across America. However, their most recent episode is really not food related. Their most recent episode is an amazing homage to what major media considers the best thing that's ever happened to the internet, Serial. Now, don't get me wrong. I listened to every episode of Serial, every week. I picked it up after Thanksgiving weekend (the Canadian one) because throughout the week before they had been interviewed on three different podcasts I listen to. They had just released their third episode at that point so I really got to relive that amazing experience we don't get anymore of waiting a week after an episode of a story to think about what happened, what will happen and talk about it with other fans. They basically reminded people of the best thing we've lost about television. I do hope their second season is as intriguing of a story, but I'm not blind, I understand the mystery of their first story is what drew most people in. I'm not sure they will find as compelling a story outside of the true crime genre. But I look forward to it. But back to Sporkful. They just created this loving homage to Serial by creating an episode which parodies the style of storytelling perfectly. In Sporkful we follow the true crime story of Heather, the victim of office fridge stealing. I laughed, I reminisced, I enjoyed. Go ahead, have a listen to it. If you loved Serial, like I did, you will be filled with knowing chuckles. If you only heard a bit of Serial you will chuckle at how formulaic their episodes were and how well Sporkful nailed it. If you've never listened to Serial, this might pique your interest.